Many parents are surprised to learn that an orthodontic evaluation is recommended before 8 years of age. There are several reasons for this. Some dental or growth irregularities can only be treated at this time. Others can be treated later but are best treated early. This is either because they respond better to earlier treatment or because they can cause other additional problems to develop. Dr. Kazmierski and the AAO (American Association of Orthodontists) recommend an orthodontic evaluation before 8 years of age. For most patients, they are not yet ready for treatment. We monitor these patients until it is the proper time to address their irregularities. Even for these patients, having an evaluation before age 8 gives the parents peace of mind because they know it is okay to wait. Early treatment makes sense when it treats a problem that can only be treated early, when it treats a problem that is best treated early, when it can prevent other problems from developing, and when it can improve the quality of the final result at the end of braces. Early treatment can be of significant benefit to patients who have an underbite (the lower front teeth extending beyond the upper), crossbite (the upper back teeth being inside of the lower), openbite (the upper and lower front teeth not meeting), crowding beyond a certain severity, and habits (such as thumb or lip sucking) that can affect the development of the jaws. Maintaining the space of prematurely missing baby teeth is also important at this age. Lastly and surprisingly, exclusive mouth breathing can cause several of the above problems. Reduced risk of needing more complicated treatments, or even surgery, later on. Reduced risk of needing tooth extractions later on. Several factors may contribute to such irregularities, including genetic factors, the early loss of primary (baby) teeth, damaging oral habits (such as thumb sucking), and developmental problems. Orthodontic irregularities may be present at birth or develop during early childhood. Crooked teeth can make good oral home care difficult and hamper self-esteem, whereas straight teeth help minimize the risk of tooth decay and childhood periodontal disease. Orthodontists recognize three age-related stages of orthodontic treatment. These stages are described in detail below. A variety of dental appliances may be used to promote jaw growth, hold space for adult teeth (space maintainers), or aid in stopping habits. Sometimes no appliance is needed for treatment and we just work with the parent and patient to eliminate orthodontically harmful habits, like thumb sucking. Our practice philosophy is to only treat early those problems that should be treated early. If a problem can be well treated later on, we wait. Treatment for impacted teeth or to prevent the impaction of teeth is sometimes initiated at this stage. Also, if there are psycho-social reasons why a patient does not want to wait for treatment with full braces, this can be a good reason to treat at this age. For patients who receive elective treatment with “braces” at this age, it is important for the patient and parent to understand that full treatment is still usually needed later on. Treatment at this stage is not as common as the stages before and after. The adolescent dentition is what springs to most parents’ minds when they think of orthodontic treatment. Patients enter the permanent dentition when they lose the last of their baby teeth. At this point, the patient is ready for comprehensive final treatment with fixed or removable appliances. There is a three year window in which it is normal for patients to enter this stage. Some patients have lost all of their baby teeth by 10 years of age. Other patients who are 12 years old still have multiple baby teeth. Both situations are usually normal. If baby teeth are still present after 13 years of age, this can indicate a potential problem and preventive intervention is frequently recommended. Some of the main goals of permanent dentition treatment include obtaining healthy tooth positions and occlusion (how the teeth contact), straightening the teeth, and improving the aesthetic appearance of the smile. 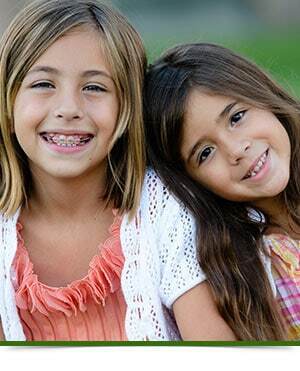 Most commonly during this period, we will provide fixed or removable “braces” to gradually straighten the teeth. If you would like to have your child seen for an orthodontic screening examination, please click here or call us to schedule a free screening appointment.